All aboard the Solway Lass, Abell Point Marina, Airlie Beach, left to right, Geoff Carlin (Research Scientist, CSIRO Oceans and Atmosphere), Alysha Sozou (Project Officer, Mackay-Whitsunday Healthy Rivers to Reef Partnership), Olivia Brodhurst (Project Officer, Reef Catchments), Al Grundy (Chair of Tourism Whitsundays), Charlie Morgan (Executive Officer, Mackay-Whitsunday Healthy Rivers to Reef Partnership) and Craig Boxer (Senior Ranger, Queensland Parks and Wildlife Service). What does the Whitsunday region look like just over 18 months after Cyclone Debbie? The Mackay-Whitsunday Healthy Rivers to Reef Partnership today launched the first collective post-cyclone regional update for the state of the Whitsundays. From river restoration and coral flipping, to tourism and a 1902 ship equipped with state of the art monitoring equipment – the document focuses on the environmental and social impact of the cyclone, and the action that has since taken place. “We are so excited to be able to help tell the recovery story of the Whitsunday region,” said Partnership Executive Officer, Charlie Morgan. “The region has banded together since Cyclone Debbie and made real headway. The release looks primarily at the natural environment from the upper catchments to the marine environment, tourism and agricultural sectors, with input from the scientific community. Ms Morgan said the natural environment and tourism were intricately connected. “Loss and destruction of our beautiful natural sites, including the Great Barrier Reef, impact many sectors, but particularly tourism – one of the lifeblood industries of the Whitsundays,” she said. Information was provided by a wide range of organisations including Tourism Whitsundays, Queensland Parks and Wildlife Services (QPWS), CSIRO, Great Barrier Reef Marine Park Authority (GBRMPA), Reef Check Australia and Reef Catchments. Craig Boxer, Senior Ranger from QPWS, said since Debbie there had been a concerted regional effort to ensure QPWS visitor facilities/infrastructure were back and operational to a high standard ensuring the best visitor experience to the Whitsundays. Coral condition up and down – In some fringing reefs around the Whitsunday Islands, between 50-100% of hard coral was lost. This includes in Blue Pearl Bay, a popular diving and snorkelling site. In more sheltered areas reefs remain largely unscathed. Alternate dive and snorkel sites have been established to reflect current conditions. Coral first aid – Activities to help restore and repair coral have included flipping and re-righting coral; reinstating coral bommies (coral ‘boulders’ or reef structures) at the devastated Mantaray Bay; 45 new Reef Protection Markers to ID ‘no anchoring’ areas – this lifted number of protected fringing reef sites from 13 to 22; and the scoping of a potential new coral nursery. Walk to recovery – Tourism repair operations are well underway. Tourism operators were excited to see the recent completion of a new walk on South Whitehaven Beach, delivering a spectacular scenic vista. There is also a new walking track to Whitsunday Craig and short walks established to viewing points at popular bays (on Langford, Haslewood and Border Islands) to aid tourism recovery. 1902 ship, now cutting edge – The Solway Lass (a two masted schooner built in 1902 that now operates as a tourist vessel) has had state of the art monitoring equipment installed. A research team can now monitor water quality and atmospheric parameters, highlighting changes as they happen. 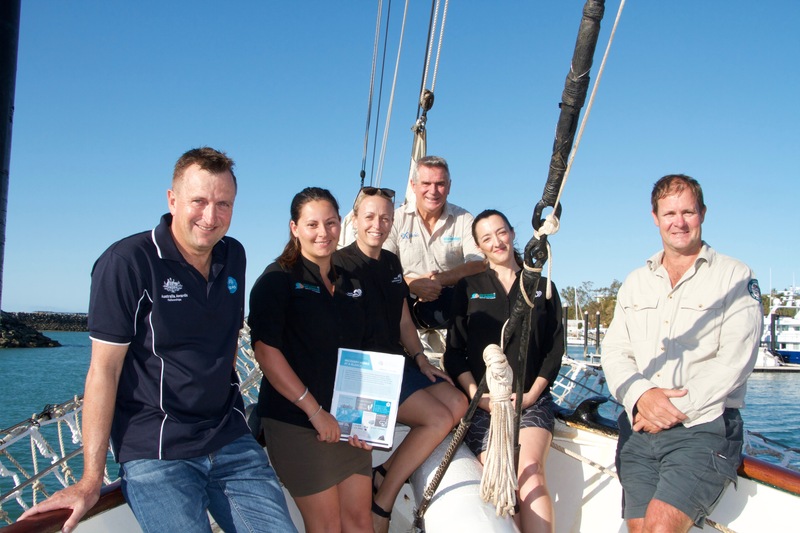 This is a coordinated research project between CSIRO and Tourism Whitsundays. Disaster recovery funds to the Whitsundays have come primarily from the Natural Disaster Relief and Recovery Arrangements, a joint funding initiative of the federal and state governments. View the feature on our website.